The company is still located in Düsseldorf, but now at Wahlerstrasse 10. In the modern complex, 30 employees of Tsurumi (Europe) GmbH run the brand's activities in Europe in an office area covering 800 m². A further 20 employees work in EU subsidiaries. Tsurumi has a turnover of 22 million euros in Germany and about 30 million euros in Europe. "We are pleased with the opportunities this site offers to us," says Daniel Weippert, together with Tomoaki Hasegawa, the company's Managing Director. "Not only will our dealers and partners benefit from this, but also our customers, who we instruct here free of charge." The manufacturer has created hundreds of marketing outlets and service sites for its customers. A mighty parent concern is behind the company: Tsurumi Manufacturing Co. Ltd in Osaka, Japan, is known as the largest manufacturer of drainage pumps for the building sector in the world, specialising exclusively in water logistics since 1924. More than 1000 employees work for the manufacturer with the blue-red swirl in its logo. They achieve a turnover of over a quarter billion euros per annum. Production takes place at several sites. The plant in Kyoto is considered as the largest of its kind in the world. In 2016 Tsurumi is also taking a logistical step forward. Now with 2500 m², the manufacturer has more than doubled its supply depot in Düsseldorf. Two large concourses with four heavy goods vehicle ramps are now available. The workshop has also been extended to facilitate even shorter throughput times. It even has a test tank for pumps of up to 22 kW motor power. 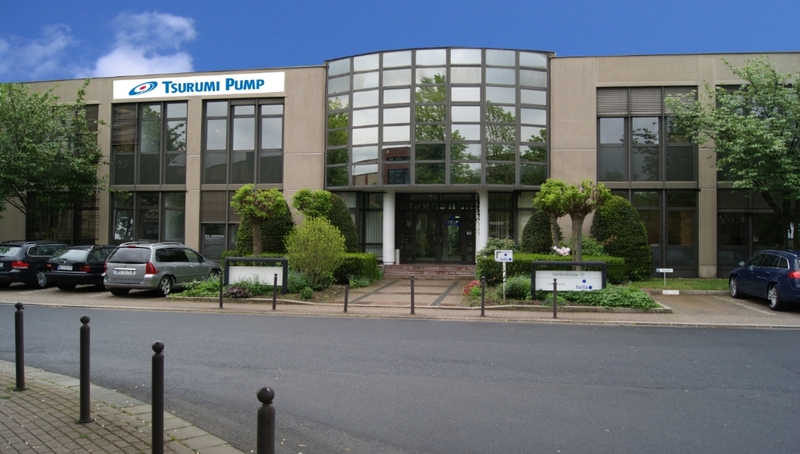 As Tsurumi operates a large pump rental business, there has also been growth in this area too. The premises and systems for reconditioning also satisfy the highest of environmental standards. Tsurumi is one of the few manufacturers in the branch holding the majority of its range in its supply depots. Most of the pumps are on their way to customers within 24 hours of ordering. Apart from Düsseldorf, the Japanese company has a further large storage depot in Antwerp, Belgium. The manufacturer's supply range is huge: More than 1800 types of pumps up to 400 kW motor power are listed for clear, waste, industrial and sewage water. This also includes innovative TRN aerators; an efficient technology for biological water treatment. The standard supply range for Europe comprises of about 250 models. With this, the manufacturer covers almost all conceivable types of application in water logistics. With civil engineering and building construction, the communal environmental sectors and industrial water processing constitute the three main pillars. The product area for fire services and disaster control is growing significantly. Many of the features of Tsurumi pumps are different from the competitors. A long service life and low overall costs are benefits often mentioned. Tsurumi is currently creating excitement by introducing its strongest electric contactor's pump to date to the market. The new LH4110W with 110 kW motor power pumps waste water with 8 mm particle diameter up to 216 m vertically upwards. More information is available at Tsurumi.eu on the Internet.